It wouldn’t be the Fourth of July without the annual Nathan’s International Hot Dog Eating Contest. This Coney Island competition is a tradition that’s been around for decades, and is truly one of the most unique sporting events out there. Today’s contest was no disappointment. Every Fourth, competitors gobble down dogs in hopes of being crowned the king and taking home the coveted mustard-yellow belt. For the last eight years, this title has belonged to Joey Chestnut, one of the most well-known names in hot dog history. But today, that all changed. This afternoon, youngster Matthew “Megatoad” Stonie took over the title when he downed 62 hot dogs in 10 minutes. For reference, that’s about 13.5 pounds. I’ll just let that sink in for a minute. 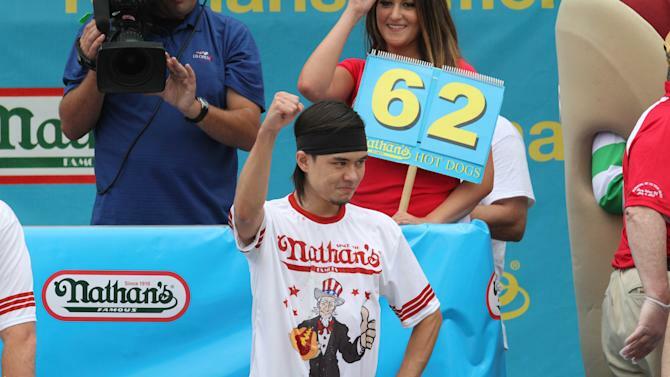 “To beat him by a couple of hot dogs this year is… you know I trained hard for this and I can’t say I came in confident, but I came in prepared,” Stonie told ESPN2. Stonie not only matched Chestnut’s attempt of 60 dogs, but passed it by two. Because once you’ve devoured 60 hot dogs in 10 minutes, what’s a few more? Despite Stonie’s dramatic de-throning, the two are all smiles. “I’ve been looking for a competition for a long time and now I have it, and now he’s made me hungry,” Chestnut said, vowing to come back next year for a rematch. And on the women’s side of things, Miki Sudo took home her second consecutive win, downing 38 hot dogs. The runner up was Sonya Thomas, who holds the women’s contest record at 45. I know all of this competitive hot dog talk is supposed to make me somewhat queasy, but I can’t help it—I’m craving a dog topped with ketchup and relish right about now. Happy Fourth, Gigglers!